The House of Broel Foundation is a historic mansion museum dedicated to the preservation of the history and culture of New Orleans. It is home to an amazing miniature museum consisting of scale model mansions, dollhouses and vignettes filled with elaborately costumed figures and intricate décor; an exhibit featuring the Louisiana Frog Farm belonging to Ms. Broel’s father and House of Broel’s display of decades of bridal fashions. Through the foundation the collections and meeting space will remain intact and available for research and exhibition to the public keeping the doors of House of Broel open for generations to come. The House of Broel Foundation was recognized as a non-profit 501 (c) (3) corporation by the Internal Revenue Service November 14, 2007 with an effective date of May 3, 2007 which was the same date the Articles of Incorporation were filed with the Louisiana Secretary of State therefore all donations are tax deductible. 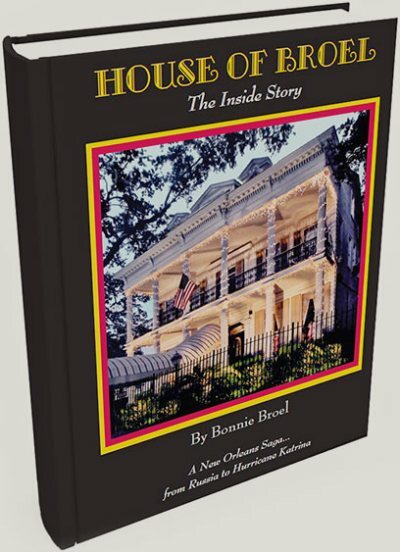 More than a memoir, Bonnie Broel’s story details her meteoric rise in the bridal fashion industry, and is a fascinating first-hand account of a truly unique New Orleans icon. By becoming a member of the House of Broel Foundation you and a guest will be able to have unlimited guided tours of the mansion and museums for one year by appointment and will also be supporting and preserving a piece of New Orleans history—thank you. Please call 504-494-2220 or send us an email with the form below.